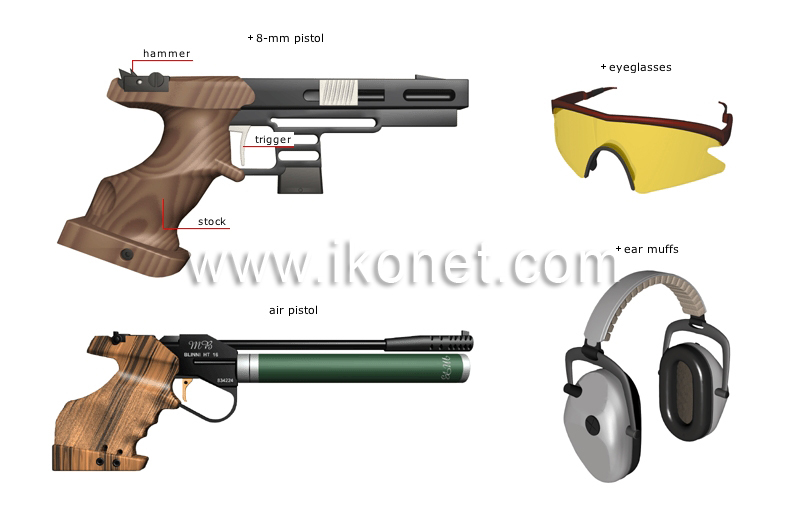 Sport that consists of using a pistol to shoot projectiles at a target a given distance away; the goal is to hit the target’s center. Very sturdy glasses that are usually made of plastic; they protect the eyes from injury and wearing them is mandatory. Short lightweight handgun that is loaded through the stock and held in the hand; it uses projectiles 8 mm in diameter. The bottom part of the pistol that is used to hold and aim it. Headband with two small cushions that muffle noise; they are mandatory for the shooters and nearby officials. Pistol that uses compressed air or carbon dioxide to shoot projectiles.